In your recent article (shown below) on the future nuclear power in America, you said that $18.5 billion would be enough federal loan guarantee money for "4-5 [nuclear power] plants." Later in the article you claimed that a new nuclear power plant is estimated to cost $5 to $8 billion. Have you read what the new PM of Japan wants to do to the U.S.? Basically it's this: Cut us off. Stop loaning us money (stop letting us use them as a military base, stop doing what we ask, etc. etc..). There goes a few trillion in "economic recovery" over the next few years right there! But perhaps more importantly from your perspective at the moment: Where do you think most of the parts for a new nuclear plant are going to be built? That's right: Japan! So expect to pay double, and then double that again, in the next few years. So $15 - $16 billion is probably low, too. And calling nuclear power a "domestic industry" is a shell game. To claim that $18.5 billion in loan guarantees is enough for 4-5 plants is misleading at best, and, at worst, shows bias in favor of starting new nuclear power plant construction even if we have to lie about what the total costs will be. Even at $15-$16 billion, or $20 billion for that matter, it's still a lie about the costs. Because nowhere in the "cost" of construction of a new nuclear power plant are the true costs to society: Not just the cancers, leukemias, heart diseases, birth defects, and other ailments that will occur to workers at the plants and/or their families, the communities around the plants, and even to people in Timbuktu, but also costs like: New enrichment plants, new uranium mines, new transport systems, and new "dry storage casks" for the spent fuel if we don't build new reprocessing plants. And if we do, the reprocessing plants will need waste storage facilities and permits to pollute the planet with radioactive carcinogens. Reprocessing wouldn't help at all. As to a permanent repository: It's proven impossible to find one that can be guaranteed to be safe, economical, or wanted, anywhere. A 20-year-old government panel -- really just a revolving door of nuclear researchers whose entire careers were probably financed by government nuke-related grants -- recently simply gave up. Instead, the Nuclear Waste Technical Review Board decided to "refocus" their efforts on reprocessing and temporary on-site storage. That's called abdication of responsibility, or more simply: Criminal negligence. I'll be happy to send you (and your editors) a bound, printed (and autographed) free copy upon request. I've distributed over a thousand bound copies, mostly to activists. Several hundred have gone to political figures, and several dozen have also been sent to members of the press. Additionally, hundreds more people have viewed the book online. Here's the comment of one Health Physicist at San Onofre, who recently BOUGHT a copy of the book, having seen a copy in the HP instructors' area of the plant: "You obviously know your stuff." He also said plant management specifically forbids HP instructors from using the book in their employee training classes. Big surprise there, but you needn't be as biased as Southern California Edison's management. In fact, you needn't be biased at all. I suggest you especially look at: "Steps in the Nuclear Process" (page 12), "What's Worse than a Meltdown" (page 15), "What Else Can (and does) Go Wrong?" (page 16), "How Far Does Radiation Spread?" (page 17), "Nuclear Waste: Your Gift to Tomorrow (page 18), "At Least I'm Insured, Right? (wrong! page 19) and the three pages on the health effects of radiation (pages 20-22). And see Stanley Thompson's comment on page 13, which will never be refuted. Upon consideration of all these problems, even $20 billion -- a figure I pulled from thin air a few minutes ago, but without a pro-nuclear bias -- would be an artificially-low-balled estimate of the true cost of a new nuclear power plant. After all, on accident WILL cost over a trillion dollars and probably shut the industry down -- the whole industry -- at least for a while. Or at least it will shut down all the remaining PWRs if it's a PWR that blows its top (such as Davis-Besse's nearly did in 2002) or the BWRs if it's a BWR that melts down for some reason -- perhaps because its overcrowded Spent Fuel Pool catches fire and falls on the reactor and its vital accessories, such as cooling pipes and control pathways. This is not impossible, just beyond the NRC's Design Basis for what can go wrong. But if a 747 pancakes down onto the SPF of a typical BWR, what do YOU think is going to happen? And if you think that would not constitute an eminent catastrophe, where in the world are you going to find an UNBIASED engineer who will agree with you? What the Nuclear Regulatory Commission says is that 747s can't crash into NPPs via terrorist acts because the TSA and the Pentagon are charged with preventing such a thing, and it is assumed (by the NRC) that they'll do their job. And the NRC also assumes that sane pilots wouldn't do a thing like that. Of course they wouldn't! Not on purpose, that is. But engines fall off. Control surfaces have separated in midair. Both bird strikes and hail have caused broken windshields and loss of power. Control hydraulics and electronics have all failed, as well as the logic boards and software programs of the modern computers. Plunging, uncontrolled dives can result from loss of control of an aircraft. A separation of laminates caused American Airlines Flight 587 to dive into the Bronx shortly after takeoff from JFK on November 12, 2001. Pilot error was blamed due to excessive pedal input after encountering wake turbulence, which stressed the rudder beyond its "design limit." But had the laminate not separated, the excessive attempt to keep the passengers comfortable rather than let the plane be tossed around a little wouldn't have cracked the rudder, rendering it useless and dooming the plane. There was some speculation that luckier pilots might still have been able to bring the craft home using the remaining controls, such as using left/right engine thrust to replicate rudder movement. We can't all be lucky, but we can assume one isn't given control of an Airbus A300-600 without having proven some talent for handling an aircraft. And everyone who steps into an airplane knows that it's better to be lucky with a bad pilot at the controls than unlucky with a good one. We can't rely on luck when millions of lives are at stake, even if we need to rely on a bit of it to get a few hundred of us from hither to yon in a tin can at 37,000 feet and 600 miles per hour these days (since far eco-friendlier and safer terrestrial vacuum-tube transport systems haven't been implemented yet, although they were invented and tested long, long ago). To get us to accept nuclear power, we were all promised that talent, skill, a safety-conscious work environment, backup systems, and constant vigilance would remove "luck" from the equation. But any student of the nuclear industry knows that in the end, it's been dumb luck that's protected us. And dumb luck always runs out eventually. An Airbus A300-600 has a maximum take-off weight of over 375,000 lbs, and a maximum fuel capacity of 18,000 gallons. Even if you subtract the weight of one engine, that's going to make a huge mess if it crashes uncontrollably into a nuclear power plant. And if you want to believe there will be no significant damage, you'll want to also assume the engine itself also plunged uncontrollably but safely somewhere, though in reality, the turbine shafts are the most dangerous part of the aircraft for those under it when it falls out of the sky. A four-engined Boeing 747-8 weighs about 975,000 pounds, holding more than three times the fuel of the Airbus twin-engined jet. There's lots of things flying around up there that can hurt us. I hope that next time you write about Secretary of Energy Steven "I love nuclear power" Chu's attempts to use his position and power to help refinance and thus restart the failing and fraudulent pro-nuclear "renaissance" and keep that murderous business firmly entrenched on its pathway to hell, you will consider the alternative viewpoints, and the many scientists and common citizens who hold them. plants, U.S. Energy Secretary Steven Chu said late Thursday. If Congress were to approve this, companies such as Duke Energy Corp.
only has authority for $18.5 billion, enough for four to five plants. Chu didn't say when he would formally propose such an expansion. Republicans have urged construction of 100 new nuclear power plants. another four to five or more, we could easily do." in order to avoid the worst of climate change," Chu said. the ones farthest along in the license application process. Electricite de France SA (EDF.FR). the loan guarantee program is remarkably unfunded." build reactors are now owned by international companies. the pioneers in the nuclear industry...We are no longer the world leaders,"
the dearth of loan guarantees and unresolved long-term waste liabilities. the firms' market capitalization, financing is extremely difficult. make...it one factor that would be trending positively." required, he said. Jaczko declined to elaborate. Is Thomas Friedman worried about his manhood? When I first read Thomas Friedman's most recent use of denigrating terminology ("wimps") to describe those who disagreed with him, I thought he was just a bit emotional. Then I went back through the record, and this Pulitzer-Prize winning New York Times author actually is rather habitual about it. Those who opposed his gas tax idea in 2006 were also "wimps," and in 2008 they had no "guts." Now, any environmentalist who opposes nuclear power has earned the moniker. And nor has the New York Times. They are the classic newspaper of America, they provide the indelible historic record, and even in this electronic era, they still hold sway over public opinion, political discourse, and thus, over public policy, as only a few other media outlets can even aspire to, let alone, come close to. And so they are the perfect place for a nincompoop to poop nincomshit. Hence, Friedman has found a home. Friedman is playing dirty, rotten pool with the facts, but how could such shoddy material slip past the editors at the New York Times? Not by accident. Unflagging support for government policies on nuclear power and nuclear weapons, and for various wars, despots, agendas and so forth, have been a part of The New York Times' editorial process for decades. The government loves a public that is asleep about the dangers of nukes. Friedman wants to help with that. Romancing France's nuclear policies is especially useful right now for the pro-nuclear agenda, because the two large French nuclear "corporations" (arms of the government, really, especially in the case of AREVA) are both buying American nuclear power companies, enrichment companies, mining companies, etc.. Once invested, they will use local employees to sway public policy based on French government interests, not those of the majority of Americans, who want to preserve our land and protect our children's DNA. 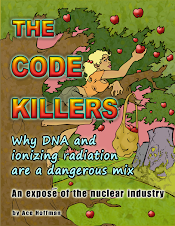 Radiation destroys our DNA, and the way the French handle their nuclear problems is to lie about them, to sink protestor's boats (and even kill protesters), and to bribe foreign workers. Yet Friedman calls us "wimps" for not embracing their murderous nuclear habit. The French also smoke a lot more cigarettes than, say, Californians. Just thought I'd mention it. Friedman would love to whip the public into a fierce frenzy. He uses the word "wimps" to describe those who oppose his point of view. Wimps are made to be broken, of course. By bigger wimps. The opposite of building more nukes isn't just "not building more nukes." It's also shutting down the ones that are currently operating. But that view never makes it into the venerable (by some vestige of their former reputation) New York Times. Only "build a lot more nukes" versus "build a few more nukes" or maybe, once in a while, "don't build any more right now." But NEVER will the New York Times give space to "shut 'em all down immediately" which is, actually, the scientifically, economically, and medically sound thing to do. Thus, the patriotic thing to do. Not doing so allows about 10 tons of hazardous high-level radioactive waste to be produced each day in America, for which no valid (safe, economical) solution exists because plain old physics gets in the way. Friedman calls Yucca Mountain "totally safe." He's totally wrong. And getting the waste to Yucca Mountain isn't safe, either. And leaving it where it is? That's the worst choice of all. Ten tons worse every day in America, and about 50 tons worse around the world. Global warming? Radiation is "hotter than hell." Each radioactive burst is a little fire, its "heat" stirs and shakes up everything around it: It spins molecules around, making poisonous mirrors of themselves. It destroys DNA. It breaks large signal proteins. It puts holes in cell walls. It creates thousands of "free radicals" at once. And there are so many radioactive atoms released in a nuclear accident! It is so great a number, that nobody expresses radiation in raw numbers. It is often filtered down into Curies, for instance. A Curie is 37 billion atomic disintegrations per second. Chernobyl released about 10 billion Curies of radiation, in mixed isotopes. Chernobyl has probably killed 300,000 people, yet pro-nukers claim it only killed 60 or 100 or some other unrealistic number, because they swear that a little radiation is good for you, because, they say, it stimulates the immune system. This flawed and simplistic hypothesis is known as "Hormesis." Randomly poisoning our children with excess radiation should not be allowed at all, but it is. Your immune system will be plenty stimulated throughout your life. This is an unnecessary and unwarranted additional burden. Being allowed to release what lax regulators call "small" amounts of radiation into the environment is a fundamental principle of business -- of economic survival -- for virtually ALL commercial nuclear facilities. They MUST leak or they will, themselves, become overwhelmed with radiation. Supposedly "only" 15 million Curies of radiation were released at Three Mile Island, although the exact amount is unknown and it could be ten times that, or worse. Yet Friedman naively believes that there were "no deaths or injuries" from TMI. Not one? It doesn't even fit the official government description of Linear, No Threshold (LNT) effects from radiation, which is the theory that radiation effects occur at any dose, and in a ratio according to dose size. The LNT theory, widely accepted in the scientific community, and in direct contradiction to Hormesis, does NOT mean that a low dose only causes a mild illness. Instead, it suggests that the rate of cancers will be approximately proportional to dose. But cancer's no fun, even if only a few people get it. I've had it. More than a few people are getting it. And radiation is a primary cause of cancer, leukemia, heart disease, and a thousand other ailments. Friedman calls those who do not endorse the random killing of humans and other living things "wimps." What are we to do when the New York Times allows him to do this, and lets him call anyone who opposes his views "wimps" year after year? Challenge him to a duel? How uncivilized! Ask them to print our responses? How hopeless! Scorn them on the Internet? Sure, it's a start. Southern California Edison (SCE), the owner of San Onofre Nuclear Waste Generating Station, is in a heap of trouble. With your help, it might shut them down forever. First of all, they're actually having trouble with the federal regulators. Imagine that! Even the Nuclear Regulatory Commission is demanding better quality control from these "closet criminals" who try to hide every mistake they make. The NRC even demanded an extra public meeting after six months instead of the normal one year. That occurs on Tuesday, September 22nd, 2009 -- not that the public is REALLY welcome, but technically, they're invited as long as they don't try to hand out literature inside the room. This practice was banned entirely effective immediately, as a response to a complaint filed by this author and his spouse earlier this year about Victor Dricks, the local public relations henchman for the Nuclear Regulatory Commission in the San Onofre district. He tried to get my table banned at the last hearing, and has successfully done so this time. It is a clear attempt by the NRC to intimidate not only THIS activist, but all activists who seek to inform the public about nuclear power. And the funny thing is, SCE had packed that same hearing with employees, who showed up with their badges and pro-nuclear attitudes. But unfortunately for SCE, I was expecting a lot of activists to show up, but only a handful actually did. Nearly half of the SCE employees took a copy of my book, The Code Killers. Because of the large SCE attendance, I was able to hand out about 80 copies -- every one I had brought. Doing so resulted in two SCE whistleblowers contacting me. One told me that the book is banned on site at the plant -- but that the management actually use it themselves because it is, after all, accurate! I was told that a post-it with my URL ( www.acehoffman.org ) is attached to one of the monitors in the instructors' area, and they are told NOT TO USE information from my web site in their courses. I have this from a very reliable plant veteran who has worked there for more than 25 years and works there still. San Onofre's numerous safety violations had so riled up the regulators that management peppered its own ranks with high-level people from other nuclear power plants around the country, after a bunch of their top people quit before being fired in disgrace. I mean, they were decimated. This is the SCE people, not Bechtel. And the "good" ones that were kept weren't so good, either -- the plant STILL has an attitude of "cover it up, don't let the regulators see it, or we'll all be in even bigger trouble." The SCE employee who ASSURED ME THAT IS STILL THE ATTITUDE THERE has over 25 years at the plant, and counting. So while the NRC thinks they are tightening the screws and making SCE run the plant correctly, all they are REALLY doing is making them try to hide the truth from the regulators! Good job, NRC. NOT. This is the federal agency the California environmental agencies rely on without question to protect your safety. It isn't being done. Some of these new top people at SCE came from the Davis-Besse plant in Ohio, which nearly melted down in 2002, AND hid numerous crimes from the federal regulators, and from the Monticello plant in Minnesota, which would have melted down if it ever needed its Emergency Core Cooling System (ECCS) to save it in the first 30 years of operation, because the shipping bolts had been left on and it wasn't actually available! These are where the replacement guys for the bad guys within SCE came from. Do you feel safer? The Bechtel employees were replaced with The Shaw Group employees, who build and operate nuclear power plants all over the world, making billions off of corrupt plant corporations that are too dumb to operate the plants themselves -- like SCE. The Shaw Group is heavily involved in projects with other corrupt nuclear corporations such as AREVA, EdF, Rosatom, etc.. Now we have these corporate parasites bringing in foreign workers from wherever in the world they want, many of whom don't even speak English yet they operate our nuclear power plants and know our secrets about how to melt them down and how they spill radiation into our environment. And they're making high fives or even six figures while they do it! If they were to come to a public hearing they wouldn't understand a word of it. Of course, they wouldn't actually see democracy in action there anyway, but that's a separate issue (see above again). SCE is also having trouble with their parts suppliers. What do you expect when Mitsubishi, a highly corrupt parts supplier to nuclear power plants, can't get the welding for the new steam generators right? That is, they can't even get them up to Japanese standards! THAT is to say, Japanese bribery-induced permissiveness standards. Forget the standards you might expect American parts suppliers to be expected to meet. And if you want to trust so-called American nuclear parts suppliers like "Westinghouse" and "General Electric" just remember to call them "Toshiba-Westinghouse" and "Hitachi-GE" if you want to get their names right. These are American companies in name only, if that. And the quality of their work reflects that, as do their business practices. Most of their new reactor activity is in China and other countries where bribery is easy to get away with. This is no coincidence, although dead Chinese officials who might have been caught and executed tell no tales. The way it works with steam generators is this: THEY ALL LEAK. They'll always leak. Some amount of primary coolant, which is filled with radioactive particles activated by the reaction in the core, as well as debris that falls off the fuel, will be spritzed into the secondary coolant via these leaks, as what can amount to thousands of gallons of water goes from the highest-pressure system to the second-highest-pressure system. That's the way all commercial Pressurized Water Reactors in the U.S. operate (about 2/3rd of all U.S. reactors are PWRs. The rest are Boiling Water Reactors (BWRs), which have their own problems). From just a few years after the first ones were installed, they realized that the SGs would leak. And profits wouldn't be ask good as they thought, but they'd still make money. So what they do is, they go in during the outages and plug up the leaky tubes. There are about 14,000 tubes in each SG (it varies, depending on the design) so plugging up even a thousand of them -- not unusual over the life of the SG -- doesn't mean you can't use them. It just means the EFFICIENCY is lowered and you'll make less money from your reactor. And your secondary coolant loop will be more contaminated (and it leaks into the tertiary coolant loop, by the way, too, at various points in the cycle). Babies -- and fetuses, and children, and adults -- die when these highly radioactive particles get out into the environment. The industry says it just becomes indistinguishable from "background" radiation but first of all, what they call "background" includes ALL previous accidents, and second of all, each ADDITIONAL spill poisons somebody -- everybody. And third of all, many of the man-made radioactive poisons are far more hazardous per Curie (a unit of measure for radiation) than the "natural" radioactive elements. And fourth of all, not only are they more hazardous, but they are where they can do more harm -- in the air, in the topsoil, in the water, rather than deep in the ground. One of the most hazardous man-made radioactive pollutants, tritium, leaks out of everything and gets into everything. It crosses the placenta and gets in your baby's DNA. And the nuclear industry thinks this is good for baby! No, it's not. It's an evil thing to do to someone, to screw up their DNA. It causes deformities, cancer, leukemia (cancer of the blood) and a thousand -- yes, a thousand, or more -- other ailments. If nothing ELSE it ages you prematurely. No one at SCE believes they are actually killing babies. They just all accept that "well, maybe a little bit IS good for you!" and stop worrying, or they say, "yeah, but coal kills, too" which is true, but irrelevant. Since you can't possibly bring your baby's lifeless body to them and say with certainty, "YOU DID THIS!" they feel safe from the wrath of their victims. Most of their victims are many miles away, scattered all over the world. Your baby's cancer might have been caused by Chernobyl, or weapons testing, or your own smoking, if you smoke. You'll never know. Lucky for SCE. Not lucky for their victims. SCE is also having trouble with the state regulators. First of all, about two years ago state senator Christine Kehoe held SWORN TESTIMONY -- a true rarity these days in public hearings -- during which the ECONOMIC FAILURE of nuclear power was clearly proven in indisputable, irrefutable terminology, with all the appropriate statistics and analysis. Second of all, the California Energy Commission (CEC) is supposedly doing its own study, and that's expected out soon and is expected to again show the rotten economics of nuclear power, again, though, even without proper accounting for the cancers in infants far away (or nearby) which are a routine and direct result of nuclear power plant operations. SCE wants to get its new steam generators stuffed in and operating before THAT report comes out, since it could remind the public (it probably won't, but it could) that every day, about a thousand new pounds of incredibly deadly, incredibly expensive, so-called "High Level Radioactive Waste" (HLRW) is created in California by its four operating commercial nuclear reactors, and we can't afford to manage THAT waste, let alone all the "quap" that's been created already -- about 10 million pounds of HLRW in California from just the four operating reactors (plus military, research, closed reactors, and other waste) that must be stored safely for thousands of times longer than California has existed as a state -- or than the U.S. has existed as a country -- or than civilization has existed, period. That report COULD be devastating, but it probably won't be since the CEC has never shown much guts for the truth. But even if it isn't devastating, SCE probably won't like it because no matter how you try to ignore the true costs of dead children, of suffering, of pain by saying "Hormesis" (the bogus theory that a little ionizing radiation is good for you) or whatever excuse you give, there are still the economic realities that these plants are expensive to build, operate, and dismantle, even without an accident that could cost trillions and happen any day. And they are prone to long and unexpected shutdowns even though the nuclear industry likes to call them "baseline power" because they are so hard to shut off and the NRC wants them to do that as few times as possible in a year, and keeps careful track of the total number of times any one plant has been shut down, especially suddenly. One of the whistleblowers I spoke to last month told me that inside the plant, ALARA does NOT stand for "As Low As Reasonably Achievable" (which is an industry term for "leak like a sieve, no one will stop you) it stands for "Always Let Another Run Ahead." In other words, smart nuke workers let dumber ones do the dirty work, so THEIR badges will show the higher accumulated dose, and THEY'LL have to go to a less well-paying job, not you. And THEY'LL get cancer from it, not you. ALARA. SCE is also having trouble with the laws of physics. The laws of physics demand that parts will embrittle, earthquakes will then rattle those parts, and the whole thing will come tumbling down some day. Try as they might -- and they are doing this 24 hours a day -- they can't make new pipes and fittings fast enough to replace the old ones that are failing, and that they feel might fail in the NEXT 20 years. They are spending tens of millions of dollars on maintenance, but only to keep an old jalopy running, that would cost tens of BILLIONS to replace properly with a new one. In other words, a drop in the bucket on maintenance compared to the cost of a full, new, "working" reactor. Not that this author wants to see NEW reactors at San Onofre (or anywhere), but we should not kid ourselves that all that money they are spending on band-aids for the old ones really buys us any protection against meltdowns. Not at all. And SCE is having trouble with their remaining employees. Else why would I have heard from TWO who were NOT on the Bechtel short end of the stick? Trouble, trouble, trouble? Not enough to make SCE afraid that we'll shut 'em down. Not nearly. For that to happen, activists will have to be much more forceful about their demands. Shut 'em down today, to prevent a meltdown tomorrow. An activist who cannot bring themselves to support immediate shutdown of their local reactor is, at best, confused. In the case of San Onofre, they're downright crazy. These reactors are dangerous, and there's no better time than right now to say: "Forget it! IT WAS NEVER A GOOD IDEA ANYWAY." The public has been duped by the Nuclear Mafia for far too long, but in the case of SCE, it's becoming hard to hide all the problems.